It is important to keep the grading and feedback process hidden from students until it is complete for all students. It is also equally important to release results once they are ready. In addition to choosing one of the methods above, you (or the person responsible) will also need to reveal student identities if using blind marking. This enables you to control the various stages of marking and withhold results from students until the final stage ‘Released’ is reached. See separate information Use Marking Workflow for Assignments. This is less preferable than Marking workflow because it removes all evidence of the assignment from the students and therefore prevents them from viewing their submission while marking is in progress. Locate the assignment and Turn Editing on. Click the drop down on Edit and select Hide. Click the drop-down on Edit and select Show. Select Reveal Student Identities in the Grading action menu at the top of the submissions table. 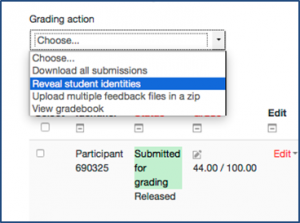 Click Continue on the following screen to release grades to the Gradebook.